A multispecies probiotic formula to meet the special needs of infants. This high-potency, hypoallergenic blend of 5 Lactobacillus species and 5 Bifidobacterium species is designed to safely meet the metabolic and intestinal support needs of infants up to the age of 2 years. All Lactobacillus species in Ther-Biotic Infant Formula produce predominantly L(+)-lactic acid that can be safely metabolized by infants. An infant’s gastrointestinal tract is not fully mature at birth and cannot metabolize the D(-) isomer of lactic acid produced by many lactobacilli. Each species in Ther-Biotic Infant Formula has been selected based on the scientific literature documenting its safety and crucial importance to the normal development of an infant’s gastrointestinal and immune systems. 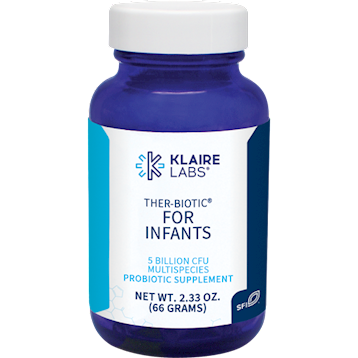 Ther-Biotic Infant Formula is designed to support a normal infant microflora that can be easily disrupted by cesarean section delivery, formula feedings, antibiotics, toxin exposures, and a maternal diet lacking in fresh fruits and vegetables.